for a really quick card. This short Rocking Card Tutorial will show you how to get results for a really quick card. There are many card folds that can be done and as you delve deeper into card making you will find more and more that you enjoy doing. But we all want really easy cards in our repertoire that we can, from time to time make up extra quickly. Cards that will suit boys or girls, and that can be adapted for any occasion too. But we don't want to be stuck with the run of the mill kind of card.... no we want something that is a little different even if it is easy. Just folding the card in half can get a bit boring, and will eventually become a hinderence rather than a help to you. 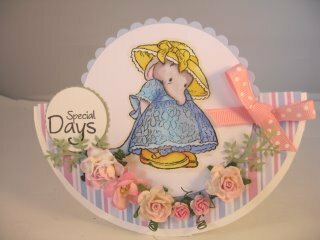 So why not try something that is quick and easy to do and will keep your cardmaking attention alive. This super easy card is just one that you may want to try. And don't forget to add the decoration to the back and then it is good from all angles. On a wet and windy day have a session where you cut your self lots of larger circles in various sizes from card and paper and keep them on one side for whenever you need a really quick card. Use all your pretty papers in lots of different colours ready to use, and of course you will match any stamped images that you use to your colour scheme. 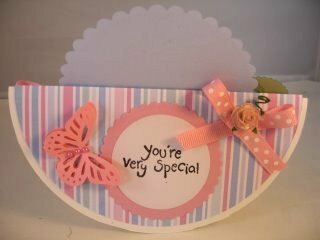 Add any embellishments that you have in your "Stash" and make it really feminine for your female cards. Use a different stamped image for the boys and leave off the flowers. Add buttons instead for a more masculine look. But whatever you do have fun with this Rocking Card Tutorial. It is easy and effective and the video is so short you won't have time to get bored.